We are in the thick of Empty Bowls season and are buried in bowls! Monday, November 12th, is the last day to paint bowls that we can guarantee will be ready in time for this year's November 23rd event. 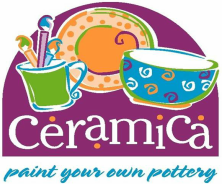 HOWEVER, Empty Bowls can be painted any time of year! Just let us know it's for Empty Bowls and we'll take it from there. We know you want to see your painted bowl after it's fired. With the utmost respect, we want you to know that that is impossible; share a special private moment with your bowl once it's painted and then kiss it goodbye. We run approximately 1,500 bowls through our little studio in a matter of weeks and they are always in various stages of being clear glazed, fired, photographed and boxed. Trust us on this, we/you will not be able to find your one bowl. Likewise, your chances of finding your bowl at the Empty Bowls event is also pretty much zero. There are 3,000+ bowls at the event and they are not all on display at the same time. BUT, because we know that you all want to see your fired bowl, Ceramica expends an extraordinary amount of time and energy to photograph ALL fired bowls, whether as part of a group that came in together (minimum 8 people) or as individual customers. These photographs and the boxing of the bowls take place as time allows by an already busy Ceramica team member who is also a student (everyone say, "Thank you Audriana"). In other words, no, we do not know when your bowl(s) will be photographed and shared. The photos are put into a collage in our graphics software with a related header (i.e. group name or customers) and then shared on all of our social media and in the photo album below. Again, we do not know when that will be and that entire process alone takes time. We work A LOT of extra hours this time of year trying to get through 1,500 +/- bowls while still operating an already busy studio 7 days a week. Therefore, please visit our online locations often to look for them. In some cases, the photographs might not even appear until the day of the event (11/23). Please know that we are as passionate about supporting The Idaho Foodbank and our local community as you are. We take our partnership with you and them very seriously. But please bear with us; we promise we're dancing as fast as we can!! Got a group of at least 25 people and a place where we can set up? If so, we'll come to you in any month other than November or December. Your Ceramica team had a blast a this years Ice Cream Social Empty Bowls event sponsored by The Idaho Foodbank and Big Al's!